LOS ANGELES, CA. 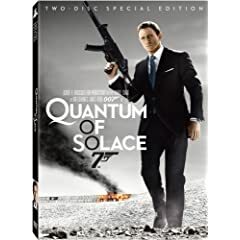 – The high-octane action of the world’s most famous secret agent continues when Quantum of Solace explodes onto Blu-ray Disc and DVD this March from MGM and Fox Home Entertainment. A worldwide box office phenomenon, QUANTUM OF SOLACE has broken countless records and scored among the top 20 film openings of all time in 67 international territories. Bond… James Bond remains one of the world’s largest and most successful film franchises with 22 films to date. Starting shortly after Casino Royale ends, Daniel Craig returns as James Bond, betrayed by the woman he loved and determined to find those responsible for her death. His pursuit and determination lead him deeper into the criminal organization known as “Quantum” and into the company of Dominic Greene (Mathieu Amalric), an environmentalist using his wealth and power to help overthrow a government in exchange for a barren piece of desert land that will allow him to control the country’s water supply. Forced to work without the help of MI6, Bond partners with Camille (Olga Kurylenko), a young woman on her own quest for justice, and together they travel across the globe in order to stop Greene and seek retribution. below. Last date for entries is March 20, 2009.